One of the most efficient ways to improve your craft is to simply know your gear; know how it works, know what features it has, know how to utilize them, and know when to use them. It sounds simple, yet I’ve met so many photographers who have top-of-the-line camera bodies but aren’t even sure how to set a two-second timer or put the camera in burst mode. Knowing how to turn on the camera and press the shutter isn’t enough. When you know your gear, it becomes an extension of you. During my last trip to Banff, I set my heart on photographing elk. 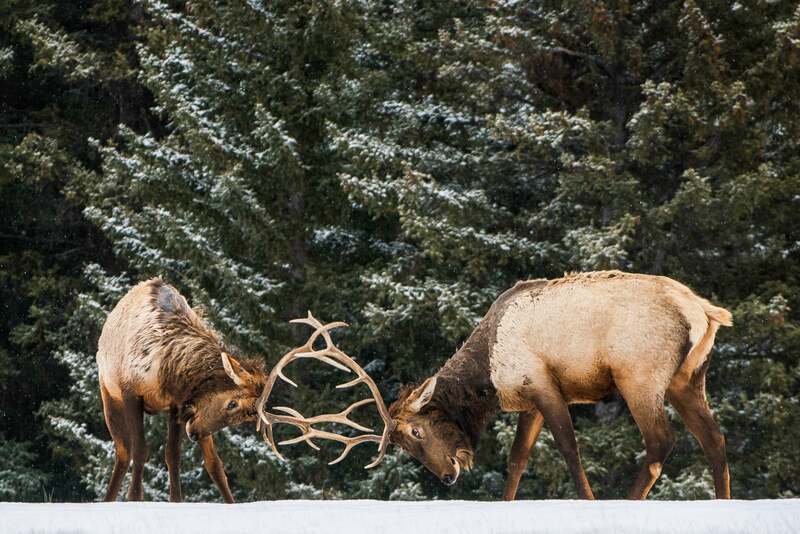 I had already seen and photographed elk in other amazing places like Rocky Mountain National Park and Grand Canyon National Park, but Canadian elk had always eluded me. I looked for them every day before the workshop began and every day during the workshop, but never saw a single one! Then, on the very last morning, after a busted sunrise and right before driving back to the town of Banff for breakfast, I saw an elk out of the corner of my eye, through the trees. I pulled over and walked to the river bank, and my mouth dropped wide open. There before me, right across a small river, was a group of five or six bull elk taking turns fighting each other. On top of that, I was completely safe because of the river, there was a perfect backdrop of snow covered pines in the background and more snow was falling. I knelt down in the snow and quietly went to work. In manual mode, I set my ISO to 500. This bumped it up enough to give me a quicker shutter speed, but not so much that I’d suffer from a noisy image. From there, I set my aperture to f/5, further allowing more light into the sensor. It was first thing in the morning, and overcast, so while there wasn’t a ton of light to work with, this gave me a shutter speed of 1/160-sec. I was shooting with my Sony FE 70-200mm f/4 G OSS lens and with Image Stabilization on, I was more than comfortable at 1/160-sec. Next, I switched my Focus Mode over to Continuous and my Focus Area to Lock-on AF. These settings, combined with using the AF-ON button to focus (puts AF start on the button on the back of the camera rather than pressing the shutter halfway down) would allow me to tell the camera what I was photographing, and the camera would then lock onto the elk and track it wherever it went within the frame. I knew this would optimize my success rate because I’ve used Lock-on AF many times in the past with great results. This is the easiest and quickest way to get access to every feature your camera has to offer, yet I rarely hear “yes” when I ask students of mine if they’ve read their manuals. Every time I get a new camera, I pour through the manual and see what features are hidden inside that I might not know about yet. Depending on the manufacturer, you can find helpful material online. If you’ve got a Sony camera, chances are there are already articles and videos online detailing how photographers set up these cameras and go over all the new features. Brian Smith and Colby Brown (both Sony Artisans Of Imagery) are great examples of photographers who regularly put out content on the best settings for specific cameras as well as the AlphaUniverse.com website where there’s a wealth of helpful information. 3. Get Out There and Shoot! It’s one thing to read about settings, but if you don’t get out there and test it out, you’ll likely forget about them. You’ve got to put in the reps. Knowing your camera like the back of your hand comes both from learning everything you can about it and putting that knowledge to use through consistently getting out and shooting with it.